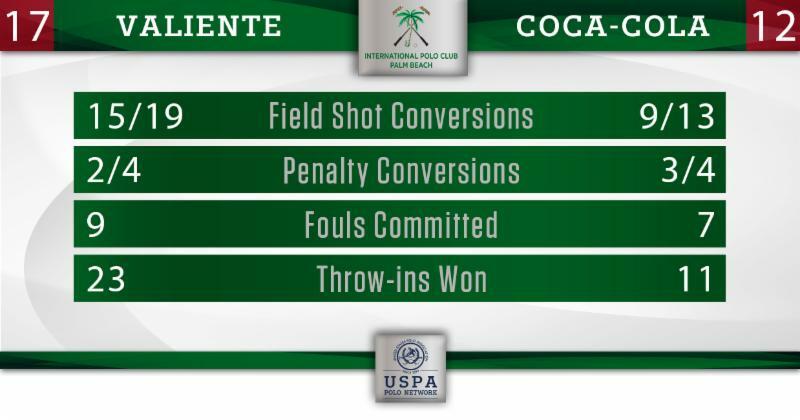 Three fouls from Valiente in the third chukker resulted in two penalty conversions for Coca-Cola, getting them back within three goals, but Valiente just could not be stopped on this day. 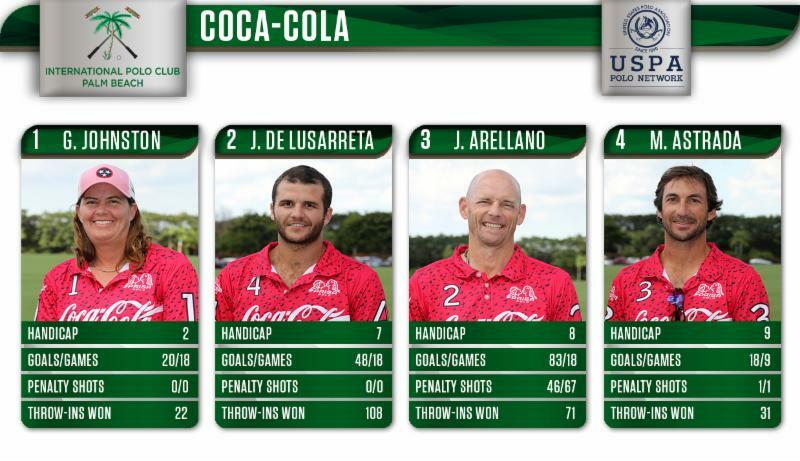 Valiente blew the game up in the fifth chukker, scoring 5 goals, winning all 6 throw-ins and preventing Coca-Cola from getting a single shot at goal as they built up a huge 17-8 lead. In a game that had a combined 6 knock-ins but 24 goals from the field, Valiente rarely missed. They made 15 of their 19 shots (79%) and controlled the throw-ins, winning 23 to Coca-Cola’s 11. 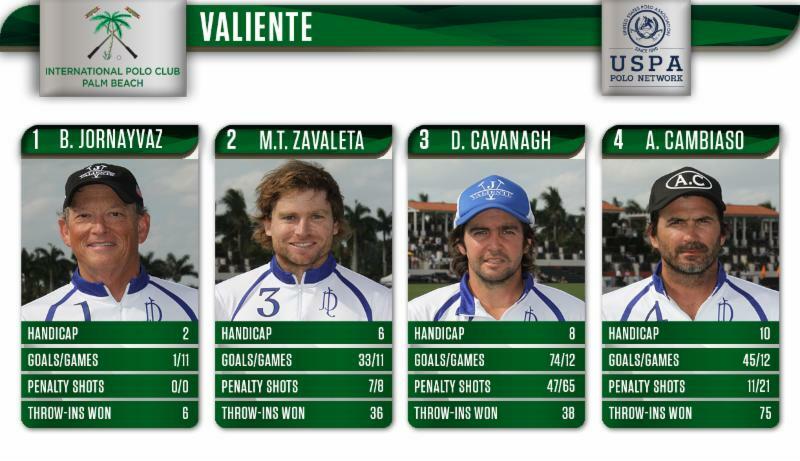 Valiente rolled to a 17-12 victory to move to 2-0 in the US Open. 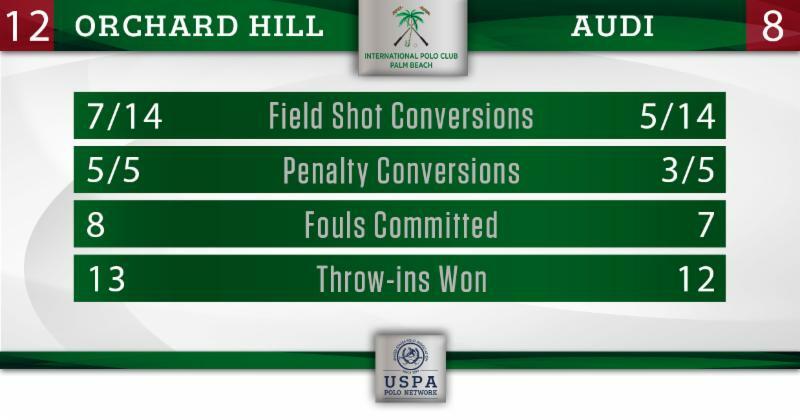 With both teams coming off an opening loss, the first game in the second round of play saw Orchard Hill come out strong, taking advantage of early foul trouble from Audi. Facundo Pieres made both attempts in the first chukker to improve on his already impressive 78% penalty shooting coming into the game. In previous games Facundo had played more of a back position passing forward to Polito, but against Audi, Facundo was attacking forward more often with the ball and Polito was staying back to protect defensively. Audi had a tough time containing Facundo, who scored the first 6 Orchard Hill goals in the game, but the masterful play of Nic Roldan kept Audi in the game. Roldan converted 2 of 3 penalty attempts along with adding one goal from the field. Alejandro Novillo Astrada played a strong back and came forward for two goals from the field in the first half. Audi played strong as a team throughout the first half, supporting each other well on offensive attacks and matching Orchard Hill shot-for-shot with each team shooting at goal 7 times in the first half. However, as was the case in their first game, shooting accuracy became an issue for Audi as they struggled to find the goal. 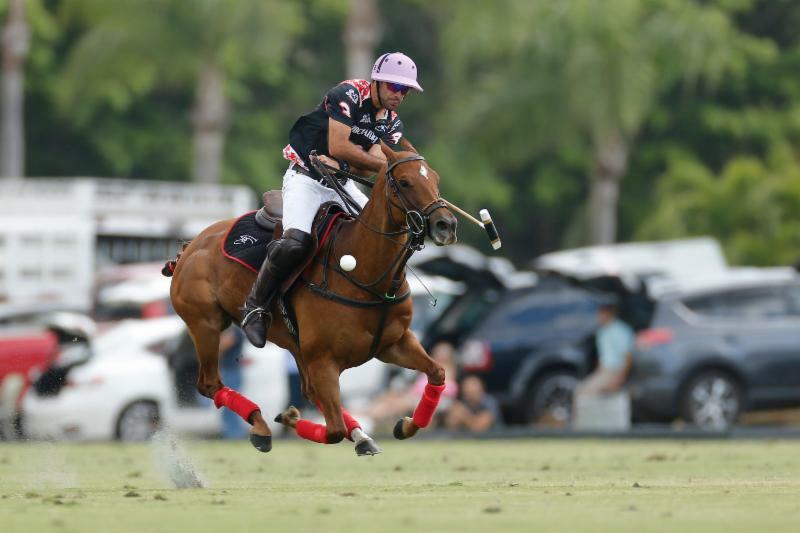 They shot 1 for 7 (14%) in the second half, which prevented them from staying in the game against a tough Orchard Hill team that had Facundo Pieres on top of his game. 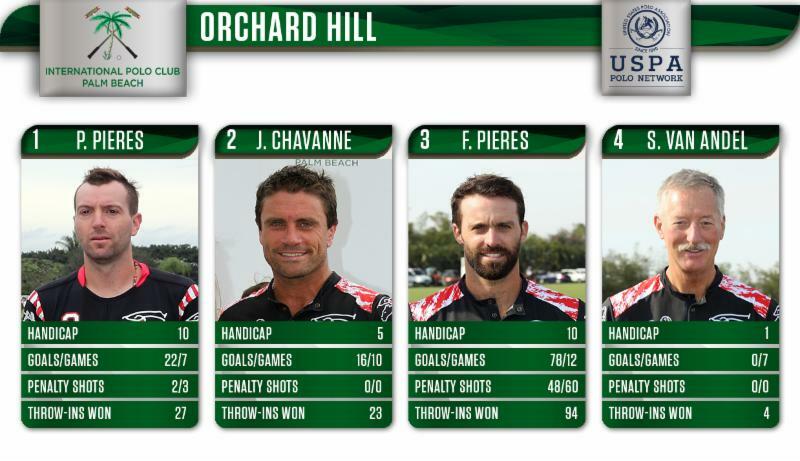 Facundo got some additional scoring in the second half with Polito Pieres converting a penalty 2 and Juan Chavanne finishing off a long run, but ultimately it was one of the best players in the world who won the game for Orchard Hill. Ultimately, the game came down to efficiency as both teams had nearly identical stats, including the same number of shots at goal and the same number of penalty attempts and only one more throw-in win for Orchard Hill. The efficiency quotient for Orchard Hill came from Facundo, who was 100% from the penalty line on the game, converting all 4 attempts. He added 5 goals from the field on 71% shooting to lead his Orchard Hill team to a 12-8 victory. 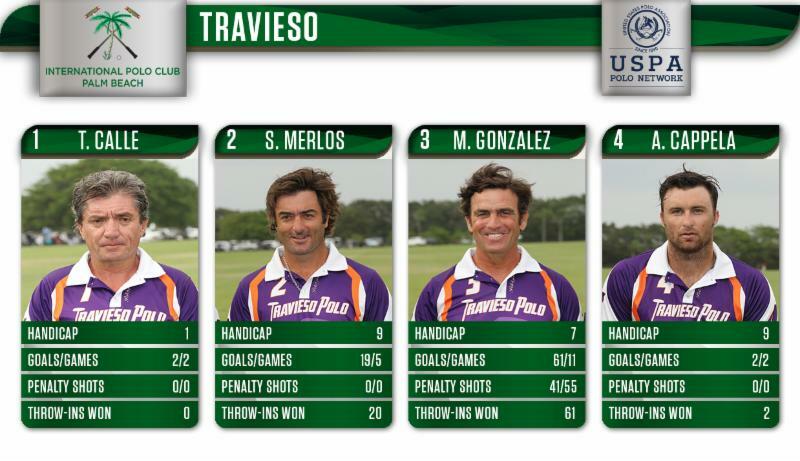 Travieso seemed to come out with a stronger performance after having one game under their belt. They got off to an early 4-2 lead behind one field goal each from Sebastian Merlos, Alfredo Capella and Mariano Gonzalez. That, plus a penalty conversion for Gonzalez, had Travieso looking strong. Flexjet, however, had their opportunities and were generating just as many chances as Travieso but missed all four shot attempts in the first chukker. Nico Pieres and Melissa Ganzi were both able to put shots through the goal for Flexjet as they continued to apply the pressure throughout the first half. 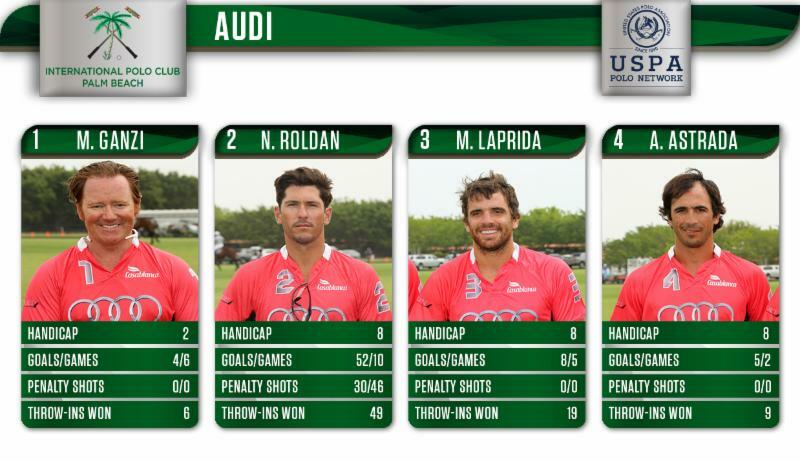 But they finished the third chukker shooting 2 of 9 (22%) from the field and trailed 6-4 at the half. All the chances Flexjet had paid off in the second half, as back-to-back penalty 2 conversions from Gonzalito Pieres seemed to get the ball rolling. 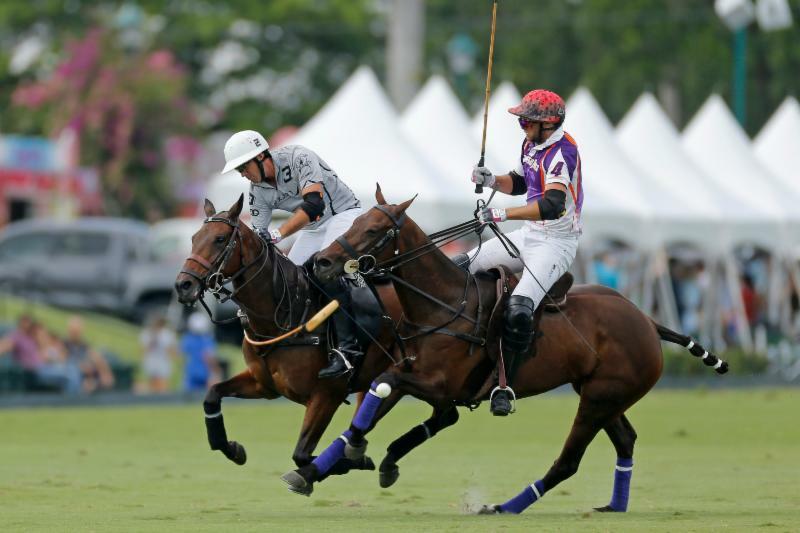 Rodrigo Andrade took over the offense from there in his best stretch of polo thus far in the 2017 season. Andrade scored two goals in the fifth chukker, adding another in the sixth to help give Flexjet their first lead in the game. With 10 more shot attempts in the second half for Flexjet, Their opponent had 11 knock-ins for the game and in the second half. Travieso had difficulty getting the ball out of their half, resulting in constant pressure. Merlos finally broke away for a goal from a knock-in, but it wasn’t enough. 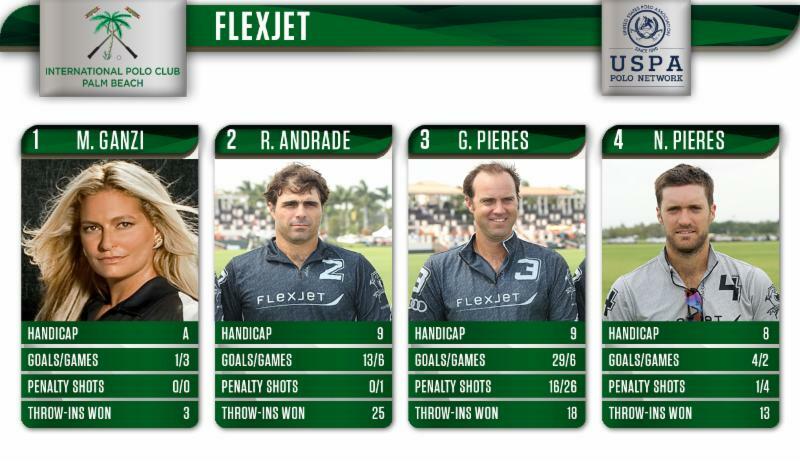 Flexjet won the second half 7-3 and finished the game with an 11-9 victory. All 8 players on the field found the scoresheet, with Mariano Gonzalez and Gonzalito Pieres leading their respective teams with 5 goals each. Nico Pieres was MVP, and “Open Galera,” played by Gonzalito Pieres, was BPP. 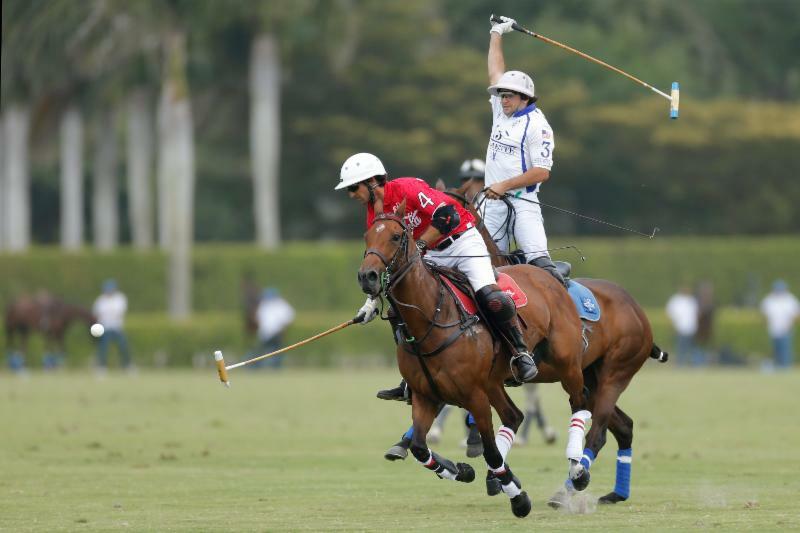 The tournament resumes Wednesday, April 12 with another triple-header: Flexjet vs. Valiente at 11 a.m., Coca Cola vs. Audi at 12:30 p.m., and Orchard Hill vs. Travieso at 5 p.m.
All games in the 2017 U.S. Open are being live streamed on the USPA Polo Network: uspolo.org.